Lake Como is the beauty queen of the Italian lakes. The turquoise and sapphire waters of its three spindly arms—splayed like an inverted Y, each roughly 50km long but rarely more than 2km wide—reflect the greenery of the sumptuous villa gardens lining its banks and the snow-capped peaks of the surrounding pre-Alps. For centuries Lake Como has seduced visitors and artists and drawn noblemen and business moguls to line its shores with gracious villas and verdant gardens—which is why this loveliest of the Italian lakes is best enjoyed from the waters on a ferry or pleasure cruise. 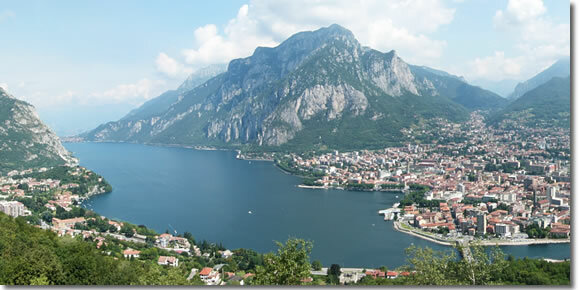 The famous silk capital of Como ★ town with its medieval churches anchors the base of the southwestern arm. However, the real sightseeing action on Lake Como takes place in the little towns clustered where the lake's three arms meet, each laden with more villas and gardens than you could see in a week. The storybook village of Bellagio ★★ sits near the tip of the peninsula where the three arms of the lake meet. It's a a popular base from which to tour the lake, with a couple of lovely villa grounds to tour. Varenna on the eastern shore, has its hillside castle and two little villa gardens (just north of Italy's shortest river, Fiumelatte). On the western shore are Menaggio, Tremezzo ★ (with the famed Villa Carlotta, best on the lake), and Lenno (with the Hollywood-perfect Villa Balbianello ★)—plus the spot by the road in Mezzegra where Mussolini was gunned down. Traveling Lake Como by boat (www.navigazionelaghi.it) is a slow, easy-going method of travel totally devoid of the traffic jams and long tunnels that often plague the roads hugging the lake shores. Who knows? You might get lucky and spot George Clooney relaxing on the terrace of the villa he bought from John Kerry in 2004. Clooney was far from the first to be drawn to Lake Como's charms. All of this land was once known as Cisalpine Gaul, a Celtic province that frequently found pitted up against a pre-Imperial ancient Rome in peninsular conflicts. Cisalpine Gaul's alliance with the Samnites against Rome failed, as did a later alliance with Hannibal. This allowed the growing Roman Republic to conquer the region and push its own borders north, establishing military camps that eventually grew into such cities as Milan, Brescia, and Como. Lake Como itself has also inspired artists and Romantics since Roman times. Several ocal boys made it big, including the ancient historians Pliny the Elder and Pliny the Younger and famed scientist Alessandro Volta. Como's visitors have ranged from composers (Liszt, Verdi, Bellini) to writers (Byron, Shelley, Wordsworth) to movie directors (parts of A Month by the Lake, Star Wars II and III, and the James Bond reboot of Casino Royale were filmed here (all, as it so happens, at the same place: the Villa Balbianello outside Lenno). If you don't take a tour or have a rental car (recommended), the easiest way is by bus (www.sptlinea.it) or by boat (www.navigazionelaghi.it). Buses are a little cheaper and more frequent, but Lake Como ferries are faster and way, way more scenic—especially since many of those amazing villas with their fabulous gardens are protected behind high walls on the landlubbing side—but from the water, you get a full-on view. Bring binoculars (and hey: you might even see George Clooney!). Trains from Milan to Varenna: Take a train from Milan's Stazione Centrale station to Varenna (2 trains per hour from Milan; 1 hr.). » How to get to Como (the town) from Milan-Malpensa airport. » How to get to Bellagio from Milan-Malpensa airport.